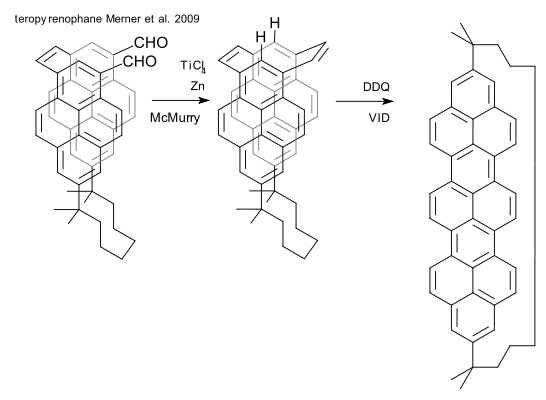 Acenes are compounds constructed as an array of linearly fused benzene rings and of some importance to the field of organic semiconductors. Synthesising them is tricky (the heptacene is currently the longest one) and forcing an acene in a cyclacene (folding a ribbon into a bracelet / belt / tube ) must be even more challenging. Cycloacenes are of potential interest due to their no doubt interesting electronic properties but also because they and related compounds represent a class of nanotube like building blocks. A cyclo(10)phenacene system (with alternating benzene units as in phenanthrene) was described in 2004, obtained by reducing the north- and south pole of fullerene (DOI). In a recent contribution from the laboratory of Rolf Gleiter, a cycloacene is prepared in a one-pot reaction from a cyclooctadiyne and the cobaltocene CpCo(CO)2 as a trimer (DOI). In one of the isolated intermediates (a trimer prior to cyclisation), the cyclooctatetraene rings, surprisingly, are almost planar!. Another recently described molecule that is guaranteed to bring down your molecular graphics editor is a pyrenophane (pyrene + cyclophane) that is exactly half a nanotube loop (DOI). Its synthesis features a McMurry reaction and a valence isomerization/dehydrogenation (VID) reaction using DDQ. The authors , Bodwell et al., are as confident today a full aromatic belt is within their reach as they were back in 2001 (DOI).